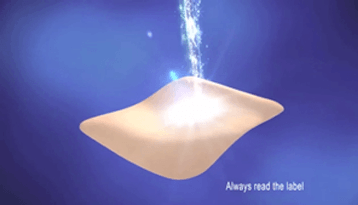 Salonpas® Pain Relief Patch features a Transdermal Drug Delivery System (TDDS), whereby an anti-inflammatory medicine is spread across an ultra-thin and highly stretchable piece of cloth, that when applied directly to the skin enables the anti-inflammatory medicine to be delivered directly to the site of pain. The thinness and flexibility of Salonpas® Pain Relief Patch makes them extremely discreet and allows them to stick firmly to any shape of the body, even over joints. Salonpas® Pain Relief Patch can be worn for up to 12 hours, day and night, and is clinically proven to provide long-lasting relief. Salonpas® Pain Relief Patch is an MHRA approved medicine containing an anti-inflammatory ingredient, which provides numerous advantages. Salonpas Pain Relief Patch® is actually a medicine and not just a device that warms up your aching body part. Salonpas Pain Relief Patch® can be applied easily and does not require any rubbing that can be painful in its own right. The sticky part of Salonpas Pain Relief Patch® is applied to the skin, so you don’t have to worry about the medicine getting in contact with your clothes or hands. Salonpas Pain Relief Patches® are ultra-thin, flexible and highly stretchable, which makes them extremely discreet and allows them to be applied to the most common sites of muscular pain. 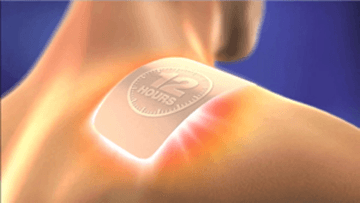 Salonpas Pain Relief Patch® can be applied for up to 12 hours and is suitable for both day - and night-time use. Our goal is to actively promote better quality of life for people around the world, offering a range of pain relieving patches. We are always keen to hear from our customers and share your feedback. “I just wanted to write and thank you for bringing out the Salonpas Pain Patches. I've had a recurring pulled muscle in my shoulder which has caused agony for months but using your pain patches has helped to dull the pain. Thanks again for relieving my pain!" If you are allergic (hypersensitive) to any of the ingredients of the medicine. If you suffer with allergic conditions, have a history of allergy or had attacks of asthma, especially when taking other pain killers, medicines to reduce fever and other non-steroidal anti-inflammatory drugs (NSAIDs). If you are taking similar pain relieving products as the combination can cause additional side effects, if in doubt ask your pharmacist. If you have had a severe heart condition. If you have severe problems with your kidneys or liver. If you have any bleeding ulcers or bleeding problem. If you are in the third trimester (last 3 months) of pregnancy. To children and adolescents under 18 years of age. The product should not be used on open wounds, irritated skin, eyes or mucosa. If you have or have had stomach ulcer/bleeding or a history of gastrointestinal (stomach) ulcer or chronic dyspepsia (discomfort after eating or heartburn). If you have a history of asthma. If you suffer with allergic conditions or have a history of allergy, especially when taking other pain killers, medicines to reduce fever and other non-steroidal anti-inflammatory drugs (NSAIDs). Exercise caution if elderly, as you are generally more prone to adverse side effects. Prolonged or repeated use of the product can cause sensitisation (hypersensitivity). Treatment must be stopped if allergic (hypersensitivity) reactions occur. Consult your doctor before using Salonpas® Pain Relief Patch if you are taking anticoagulants such as warfarin (medicines that thin your blood). Store the medicine below 25°C, in the original package in order to protect from light. Whenever a patch is removed from the packaging, carefully fold the open side of the sachet twice to protect the remaining patches from light. Do not use Salonpas® Pain Relief Patch after the expiry date which is stated on the box, or more than 3 months after the packaging is first opened. Active Ingredients (each patch) - 105mg of methyl salicylate, 31.5mg of levomenthol. Inactive ingredients - Alicyclic saturated hydrocarbon resin, liquid paraffin, polyisobutylene, styrene-isoprene-styrene block copolymer, synthetic aluminum silicate, backing cloth and plastic film.